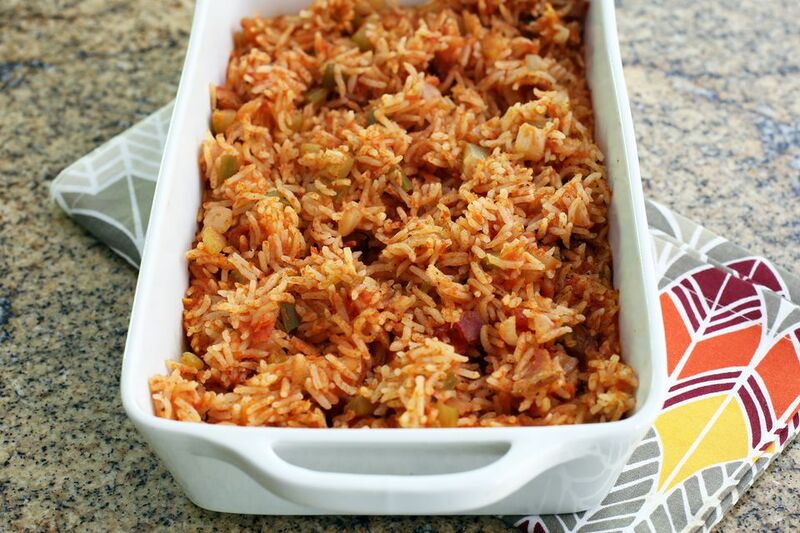 This Savannah red rice is very easy to make, and it bakes to perfection in the oven. Just briefly saute the peppers and onions, add the rice and sauce, and bake. Savannah red rice is also known as Lowcountry, Gullah, or Charleston red rice. Rice was a major crop of the Lowcountry region until the end of the Civil War, and red rice was common along coastal regions of South Carolina and Georgia. The rice dish was first brought to the U.S. by enslaved Africans, and it resembles the West African dish, jollof rice. In fact, many of our Southern rice dishes, such as jambalaya, hoppin' John, and gumbo, probably evolved from African dishes. This red rice includes tomatoes, peppers, onion, rice, bacon, and other ingredients. The recipe is easily scaled up or down, depending on the size of your family or group. It's an excellent dish to take along to a potluck or party, too. Just make sure to keep it warm in the slow cooker or a chafing dish for serving. Butter a large baking dish (about 2 1/2 to 3 quarts in size). Prepare the vegetables. Peel the onion and chop it finely. Chop the celery. Remove the stem and seeds from the bell pepper and chop it finely. In a large heavy skillet over medium heat, fry the bacon until crisp; remove the bacon to paper towels to drain; crumble and set aside. In the same skillet with the bacon drippings, saute the chopped onion, celery, and bell pepper until just softened. To the skillet, add the rice, the pureed tomatoes, the drained crumbled bacon, half of the salt, pepper, sugar, and hot sauce. Bring the rice and vegetables to a boil; reduce the heat to low and simmer for about 5 minutes. Taste and add more salt, if needed. Cover the baking dish tightly with foil and bake the rice in the preheated oven for about 40 to 50 minutes, or until the rice is tender. Check the rice after about 30 minutes and add water or stock, if necessary, to keep the rice moist. If you don't have tomato puree, substitute with tomato sauce. Simmer the tomato sauce to reduce and thicken it slightly. Or add a few tablespoons of tomato paste to the tomato sauce.